(From Nikon lens literature) Nikon Inc. has announced two new super telephoto lenses, the AF-S NIKKOR 500mm f/4E FL ED VR and AF-S NIKKOR 600mm f/4E FL ED VR. These two NIKKOR lenses use the latest Nikon lens technologies to enhance autofocus (AF) tracking and optical performance, while benefitting photographers with a significant reduction in weight. Ideal for sports, action, wildlife and press events, these lenses offer photographers the ability to capture striking images from afar with brilliant clarity and sharpness. "The new NIKKOR 500mm and 600mm f/4 lenses were developed to give photographers the advantage on the sidelines or in the field, with a lens that can keep up with the action and get the decisive shot," said Masahiro Horie, Director of Marketing and Planning, Nikon Inc. "By the fourth quarter or final period, users will sincerely appreciate the weight reduction of these lenses which allow for extended shooting, even into overtime." These new super telephoto NIKKOR lenses have been optimized for today's high-resolution image sensors and fast-shooting Nikon DSLR cameras. The new lens designs significantly improve AF tracking performance, helping photographers to capture images of dynamic wildlife or athletes in precise clarity, even when subjects are moving erratically, at random speeds or at the camera. Both lenses also utilize Nikon's Electromagnetic Diaphragm, helping to maintain consistent exposure during high-speed burst shooting of fast action. Because the AF-S NIKKOR 500mm f/4E FL ED VR weighs in at just 6.8 lbs./3090 grams (vs. 8.5 lbs./3880g of its predecessor), super telephoto performance has never been so light. This premium NIKKOR lens is ideal for nature and sports photographers who are always traveling on assignment and are looking for a fast aperture lens to capture photos and HD video from a distance. The combination of nimble agility, low-light capability and superior optical performance makes this lens an obvious choice for tack-sharp images of birds in flight, aircraft or other fast moving subjects when a tripod is not always an option. The optical formula of this lens combines two fluorite elements and three Extra Low Dispersion (ED) glass elements to further reduce chromatic aberration while providing superior sharpness and color accuracy. For long reach with superior optical performance, professional photographers should consider the AF-S NIKKOR 600mm f/4E FL ED VR, which provides the ultimate in fast-aperture and focal distance for challenging subjects. With a wide aperture of f/4, the new 600mm lens gives the photographer the ability to fill the frame and create dramatic separation between subject and background. With a weight of merely 8.4 lbs. /3810g (vs. 11.5 lbs./5060g of its predecessor), the lens features two fluorite lens elements and four ED elements to provide discerning photographers with unrivaled sharpness. Adding to a long legacy of renowned optical excellence, both lenses feature the most advanced NIKKOR lens technologies, including the addition of Nikon's exclusive Nano Crystal Coat to further reduce instances of ghosting and flare; an essential feature for capturing outdoor sports or action under the lights. Both lenses also incorporate Nikon Vibration Reduction (VR) technology, affording up to four stops of image stabilization, with automatic tripod detection to counteract vibrations when mounted on a tripod. For pros shooting fast and erratic moving sports or subjects, using the SPORT VR mode will yield a more stable viewfinder image whether handholding the lens, using a monopod or even when panning. For enhanced durability, both lenses are sealed and gasketed against the elements and have a fluorine coating on a front protective meniscus element to make it easier to remove dirt, moisture and smudges from the lens surface. For shooting from extreme distances, the new lenses are also compatible with select Nikon teleconverters that provide photographers with the ability to autofocus up to f/8 with many Nikon professional DSLR bodies. The new AF-S NIKKOR 500mm f/4E FL ED VR will be available in mid-July for a suggested retail price (SRP) of $10,299.95. The AF-S NIKKOR 600mm f/4E FL ED VR will be available in mid-July for the SRP $12,299.95. Both lenses also come with a newly redesigned, lightweight, custom-fit hard case for transport. 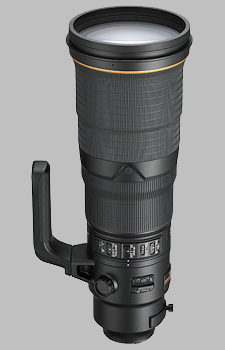 The Nikon 500mm f/4E FL ED AF-S VR Nikkor doesn't have any user reviews yet!